← The Great Bob Dylan Is A Fan of My Mulligan Novels! Liam Mulligan, the eponymously-named investigative reporter and main character of Bruce DeSilva’s terrific new novel A Scourge of Vipers is the last of a breed. Anarchic, hilarious, fearless, altruistic, smart-mouthed and above all bedrock decent, the hero of DeSilva’s fourth Rhode Island mystery is at it again.“Trouble is my business,” he quips to a friend, but on the bottom line, he isn’t kidding. Both professionally and temperamentally, Mulligan goes looking for it. This time around, Mulligan’s stepped into a nest of killer-bees, including some very bad customers on both sides of the law. The issue? Mulligan’s close friend from childhood, the former nun, Fiona McNerney, now Rhode Island’s governor, proposes to legalize sports betting in order to raise revenue for the Ocean State. The Mob, of course, opposes the governor’s bill. They want to maintain their monopoly on sports gambling in the states where it’s illegal. The NCAA and pro sports franchises, too, are against legalization, though not for the reason one might suppose. Nearby casinos, on the other hand, like the idea. They hope to clean up by getting a piece of the action. The one objective these factions all have in common is to keep Liam Mulligan’s newspaperman’s nose out of their business. The Providence police, some of them anyway, detest Mulligan even more. Even Mulligan’s corporate, yes-man boss has little use for him. The only reason he keeps him around is to rewrite press releases. Soon enough, as the gambling war heats up, Mulligan finds himself a suspect in a related missing person case, not to mention a target of a hitman whose fecklessness makes him all the more dangerous. At the same time, Liam, a former college hoopster, is trying out for Providence’s Class D pro basketball team. Oh, and he’s taken in a homeless bouncer who “drinks a sixpack a day and farts a lot.” And he wants desperately to win back his former girlfriend, Yolanda, a beautiful and brilliant African American attorney and a great character in her own right. I, for my part, learned something new from every page of Bruce DeSilva’s new book. 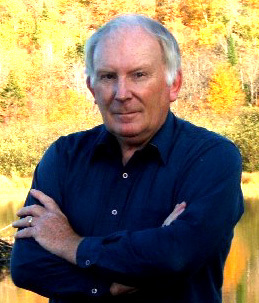 DeSilva, a long-time newspaperman himself, knows everything there is to know about the newspaper business, small-city politics, basketball and, not incidentally, the very good heart of Liam Mulligan. But what about the vipers in the novel’s title? I’ll say this much. Yes, you’ll meet a real reptile in this terrific story, a harmless and rather endearing little garter snake Mulligan makes a pet of. 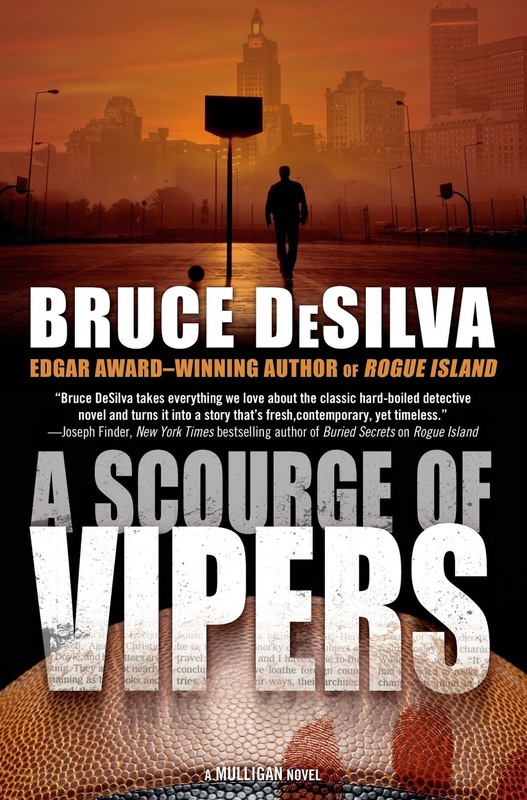 For the true “vipers,” though, you’ll have to follow DeSilva’s reporter through the river-front tenements and backroom gambling dens and corrupt police precincts of “Rogue Island.” That’s a trip you’ll enjoy. There’s even a hint or two of what devilment Mulligan may be up to in the next installment. My crime novels featuring Liam Mulligan have won the Edgar Award and the Macavity Award and been listed as a finalist for the Shamus, Barry, and Anthony awards. The new novel, A Scourge of Vipers, has received rave reviews in The New York Times, Publishers Weekly, and a host of other publications. You can order any of the books in the series from independent or chain online bookstores by following this link. This entry was posted in Uncategorized and tagged A Scourge of Vipers, Anthony Award, Bruce DeSilva, edgar award, gambling, hardboiled, Howard Frank Mosher, Liam Mulligan, Macavity Award, Mark Twain, Rhode Island, Shamus, sports betting, The Great Northern Express. Bookmark the permalink.